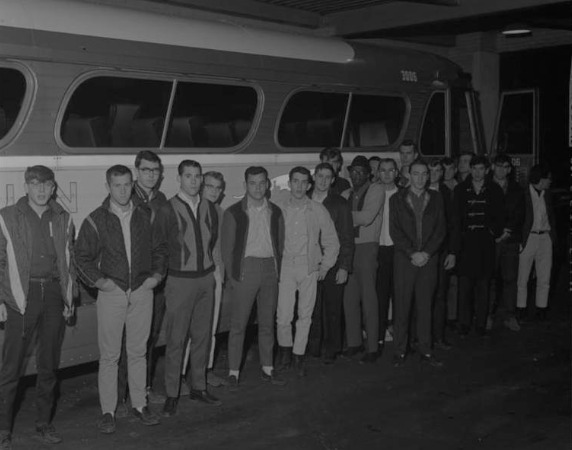 In November 1965, draftees are leacing Ann Arbor, MI to be processed and sent to basic training camps. The November 1965 draft call was the largest since the Korean War. The military draft brought the war to the American home front. During the Vietnam War era, between 1964 and 1973, the U.S. military drafted 2.2 million American men out of an eligible pool of 27 million. Although only 25 percent of the military force in the combat zones were draftees, the system of conscription caused many young American men to volunteer for the armed forces in order to have more of a choice of which division in the military they would serve. While many soldiers did support the war, at least initially, to others the draft seemed like a death sentence: being sent to a war and fight for a cause that they did not believe in. Some sought refuge in college or parental deferments; others intentionally failed aptitude tests or otherwise evaded; thousands fled to Canada; the politically connected sought refuge in the National Guard; and a growing number engaged in direct resistance. Antiwar activists viewed the draft as immoral and the only means for the government to continue the war with fresh soldiers. Ironically, as the draft continued to fuel the war effort, it also intensified the antiwar cause. Although the Selective Service’s deferment system meant that men of lower socioeconomic standing were most likely to be sent to the front lines, no one was completely safe from the draft. Almost every American was either eligible to go to war or knew someone who was. Conscription during the 1960s took place under the legal authority of the peacetime draft, because the United States never formally declared war on North Vietnam. Legal authority for a peacetime draft came from the Selective Training and Service Act of 1940, signed by President Franklin Roosevelt in order to mobilize American civilian-soldiers in anticipation of entry into World War II. During the Korean War, the Selective Service began the policy of granting deferments to college students with an academic ranking in the top half of their class. Between 1954-1964, from the end of the Korean War until the escalation in Vietnam, the “peacetime” draft inducted more than 1.4 million American men, an average of more than 120,000 per year. As part of their Cold War mission, many state universities required ROTC training by male students, although campus protests caused administrators to begin repealing mandatory ROTC in the late 1950s and early 1960s. Lyndon Johnson ran as the “peace” candidate in his 1964 campaign against conservative Barry Goldwater, who wanted to escalate the military offensive against North Vietnam and the Viet Cong guerillas. In October, at a campaign appearance in Ohio, Johnson promised that “we are not about to send American boys 9 or 10,000 miles away from home to do what Asian boys ought to be doing for themselves.” But in the months after the Gulf of Tonkin Resolution, Johnson rapidly increased the U.S. military presence in the defense of South Vietnam, with 184,000 troops stationed there by the end of 1965. During that pivotal year, while UM professors organized the first Vietnam teach-in and Students for a Democratic Society launched the campus antiwar movement, the U.S. military drafted 230,991 more young men. During the next four years, the Selective Service inducted an average of around 300,000 young men annually--including a significant percentage of the 58,156 American troops who would die in the conflict. America Had No Choice But to Escalate? The military draft and the escalation of the Vietnam war played a major role in turning direct action resistance into a mass movement on college campuses in the mid-1960s, including at the University of Michigan. In a 1965 Michigan Daily article, experts unveiled the fear that the military was not receiving enough volunteers and recognized the need to make military service more attractive to well-educated Americans, not just to those who had no other option but enlistment or induction. Bill Ayers, a UM student activist who was arrested in a 1965 sit-in at the Selective Service Office, discussed how conscription can actually benefit society in a 2015 interview. First, he argued, because the draft affects the people around an individual, they are more likely to pay attention to the foreign policy decisions being made by the government. Therefore, Americans in the era of the draft were much more actively engaged in politics and in questioning the true consequences of foreign policy decisions. Second, Ayers pointed out that an all-volunteer military has created a poor man’s army, because enlistment is attractive to individuals who have no other options because they are poor or uneducated. On December 1, 1969, the first draft lottery since 1942 began, but college deferments were kept intact. Anti-war activists recognized the draft lottery system did not produce truly random results. The draft received even more resistance as dissenters became more frustrated with the system. Finally, Nixon ended the draft in January 1973, but by then the war was almost over. Citations for this page (individual document citations are at the full document links). 1. Michael S. Foley, Confronting the War Machine: Draft Resistance during the Vietnam War (Chapel Hill: University of North Carolina Press, 2003), esp. pp. 35-40; Christian G. Appy, Working-Class War: American Combat Soldiers and Vietnam (Chapel Hill: University of North Carolina Press, 1993), esp. pp. 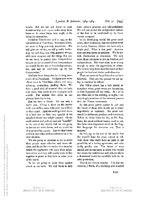 1-43 (quotation p. 27). 2. 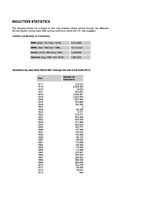 Selective Service System, “Induction Statistics, <https://www.sss.gov/induct.htm>, accessed April 26, 2015. 4. 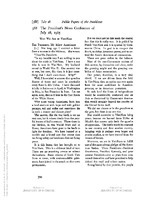 Lyndon B. Johnson, “The President’s News Conference: Why Are We in Vietnam?” July 28, 1965, Public Papers of the Presidents of the United States, 1965, Book II, pp. 794-803. 5. “Experts See Changes Needed in Draft Policy,” Michigan Daily, May 20 1965. 6. Interview of Bill Ayers by Obadiah Brown and Chris Haughey, March 26th, 2015.
about the history of the University of Michigan and its relationships beyond its borders.